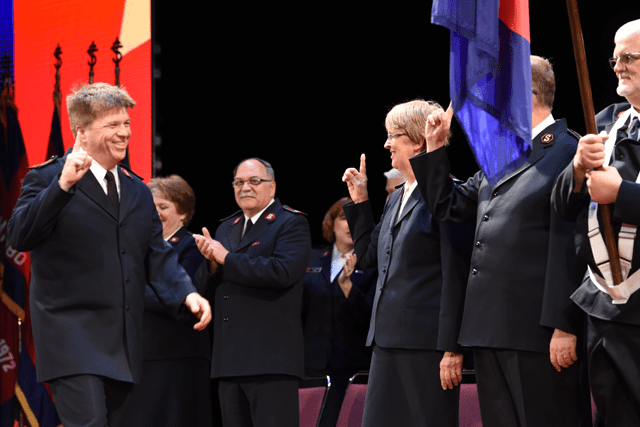 Nearly 3,000 Salvationists and friends of the Western Territory welcomed the Territorial Executive Council with territorial leaders Commissioners Kenneth G. and Jolene K. Hodder and international leaders General André Cox and Commissioner Silvia Cox to the stage of the Terrace Theater June 4 for the Mobilize 2017 Service of Appointments. 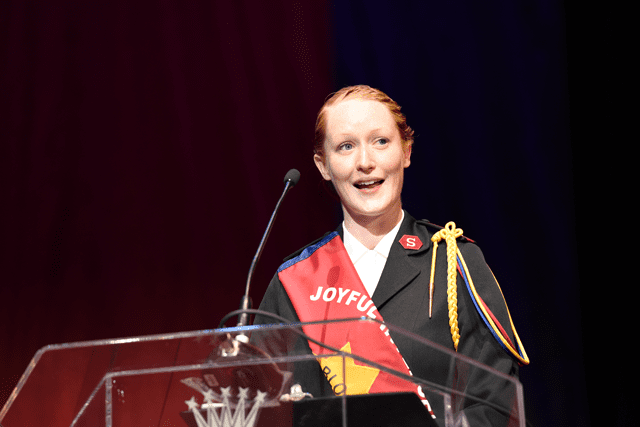 Following an introduction to this year’s Service Corps teams and Long Service Order recipients, the now second-year Messengers of the Gospel took to the stage before the newly commissioned Joyful Intercessors marched in, each draped in a red session sash. Kenneth G. Hodder announced the Western Territory’s World Services and Self Denial gift of over $8.1 million. 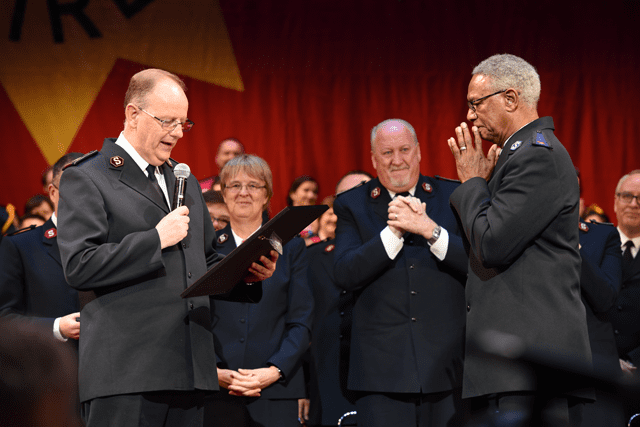 In a surprise presentation, Hodder called to the stage Envoy Joseph Moore, long-serving Salvationist at the Bell Shelter in Southern California. The General admitted Moore into the Order of the Founder, The Salvation Army’s highest award for a non-officer. In his call to action and charge to new officers, Kenneth G. Hodder noted many examples of the flaws of biblical heroes. “If we have heard anything this weekend, it has been that each of us must respond to need. We cannot allow ourselves to sit back,” he said. “Every single one of us has a part to play. If you don’t feel that you have the skills or the ability or the time or the expertise to do something to build up the kingdom of God, well then you haven’t been listening and don’t know your Scripture. Jolene K. Hodder led the congregation in singing “Tell Them in the East” before Lt. Leah Fowler spoke on behalf of her session about the many lists she has seen during two years at the College for Officer Training. 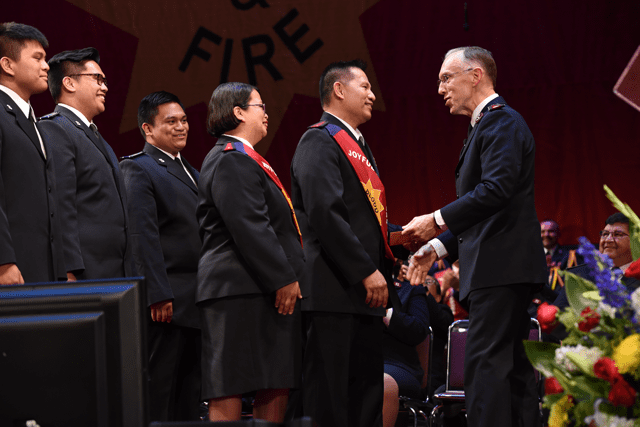 The Territorial Staff Band offered “The Ambassadors” by Peter Graham before the Hodders presented the 50 Joyful Intercessors with their first appointments as Salvation Army officers. Program Secretary Lt. Colonel Lee Lescano offered a final prayer and led the closing choral benediction.